Try as you might, fast food chains have made it harder than ever to resist your cravings for its calorie bomb menus. From Taco Bell's recent foray into nationwide delivery, to the fact that Wendy's is giving out free Baconator fries this week, your willpower doesn't stand a chance in the face of all the wallet-friendly convenience. 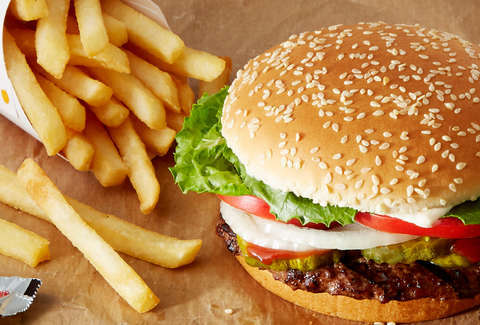 And as though it weren't possible to be any more tempted to ditch your beach body diet, now Burger King and Postmates have stepped up with a new wildly affordable delivery deal that hooks you up with food-packed King Box for just $3. From now through February 24, Postmates and Burger King are running a special $3 delivery deal on the Burger King King Box, which comes with your choice of entree, small fries, two cookies, and a small drink. In terms of entrees, you have your pick of a Classic Whopper, Crispy Chicken Sandwich, Spicy Crispy Chicken Sandwich, or 3-piece Crispy Chicken Tenders. That's a hell of a lot of food for 12 quarters. To get the deal, you'll need to be in one of the 3,000 cities where Postmates is available, search for the nearest Burger King in the app, and customize your King Box order. From there, you'll be on the hook for the delivery fee and a "small cart" fee, which means you won't technically be getting your food for three bucks when it's all said and done. However, if you sign up for Postmates Unlimited (which costs $7.99 a month), you do get free delivery. Our hearts go out to your Keto diet.